Posted August 27th, 2015 at 3:03 pm. 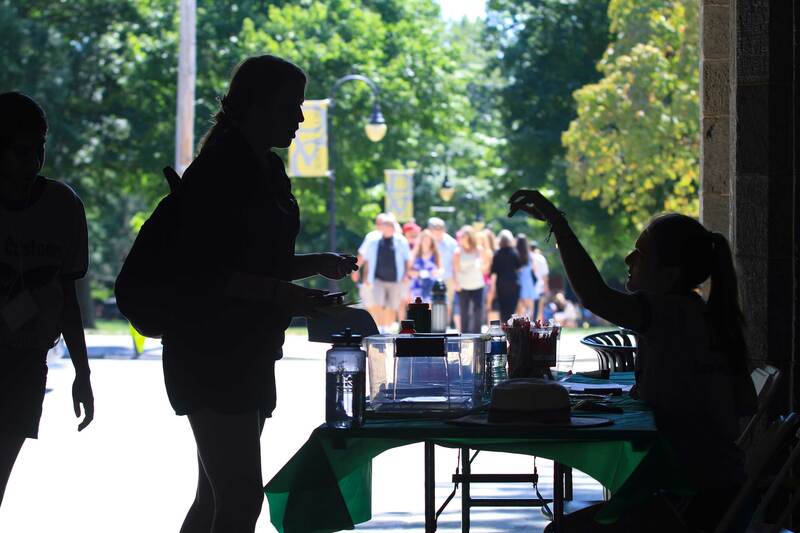 Mild temperatures and sunny skies made for a perfect move-in day for Bryn Mawr College’s class of 2019. The 389 member undergraduate class is the largest to ever enroll at Bryn Mawr. Thirty six states, Washington, D.C, Puerto Rico, the U.S. Virgin Islands, and 36 foreign countries including Albania, Brazil, China, Cuba, France, Ghana, Haiti, India, Indonesia, Iran, Kenya, Mexico, Pakistan, The Russian Federation, Rwanda, Trinidad and Tobago, the United Kingdom, and Vietnam are represented in the class. In addition to setting up their rooms, the members of the class spent move-in day getting to know each other, their deans, and staff members from a number of offices including Academic Support and Learning Services, Campus Safety, the Health Center, Counseling Services, and Information Services. Bryn Mawr President Kim Cassidy and other campus leaders addressed the class and families at a mid-day welcome assembly and they were joined again by Cassidy later in the afternoon at an informal get-together on the lawn in front of Denbigh Hall. Customs Week continues through the weekend. The 2015-16 academic year begins on Aug. 31. Fall convocation will be held at 4:30 p.m. that day in Goodhart Hall, when President Cassidy will announce the name of the “New Perry.” Following Convocation there will be a picnic outside of the new residence halls. There will also be tours of the new residence halls. Tour organizers remind everyone to please be respectful of the residents’ space and privacy while touring the buildings.